When daybreak temperatures are in the high twenties, it feels more like deer season than turkey season. That is what many Deep South gobbler chasers faced the last full week of April, as cold temperatures and a decrease in gobbling activity added to already late spring states like Alabama, Mississippi, and Georgia are experiencing. With the turkeys and foliage a couple of weeks behind, the hunting has been a little tougher (or more competitive with few hens nesting and thus still bunched up with the gobblers), but brighter and warmer days are ahead. If anything, the late spring should “prolong” the season a bit. Here in west Alabama, on an average year our turkeys have quit gobbling well or altogether by April 10, leaving us with an empty feeling until the second peak of gobbling returns during the last few days of our season. This year, we could realistically have strong gobbling through the end of April, which would certainly be a nice respite from years past in which Alabama hunters would be better served heading north to Kentucky or Ohio for the end of April. With the number of gobblers still in the woods, the hens on the verge of nesting, and the weather appearing to be headed towards a warmer and drier fifteen day stretch, the action should be really hot over the next two weeks in the Deep South. Let’s check in with some other gobbler chasers to get their opinion on where the southern birds are! 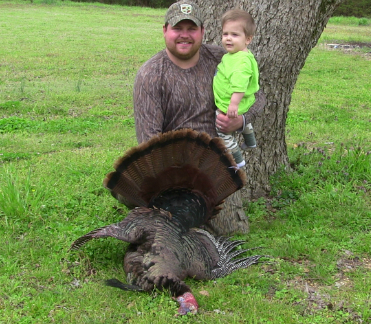 “Our turkey season got off to a rocky but successful start. Youth weekend was successful, but I had my doubts at daylight that Saturday morning. We heard a handful turkeys gobble on the limb, but they only gobbled once or twice a piece. After they hit the ground, only a couple of birds continued to gobble and we could hear hens with these birds. Equipped with a ground blind and the new Avian X Strutter, we set up on a food plot close to where we had heard a gobbler roosted before daylight and began to call. A short time later we got a response, and 45 minutes and 3 or 4 gobbles later, I filmed a gobbler beat up the new strutting decoy before my friend’s five year old son harvested his first gobbler." "Cold and wet weather kept the gobblers tight lipped for the most part during the first week of regular season in Pickens and Tuscaloosa Counties. I talked to a few guys hearing decent gobbling, but most were hearing a few gobbles on the limb followed by silence after flydown. After a few days of this, we began to catch on and waited the gobblers out until they began to gobble during the mid-morning hours. This approach proved successful and began putting gobblers into gun range. Although the turkeys were coming in, they still were saying much. I was fortunate to call in 4 gobblers that either myself or friends of mine shot the first week of season and these 4 birds gobbled a combined total of 12 times."